Japanese knotweed has astounding regenerative prowess and the capacity to spread at lightning speed, especially near streams and roadsides. It is a rapidly growing, perennial plant with characteristic purple spots on the stem. The tubular structure of the stem allows even tiny pieces of knotweed to float through waterways and readily access new habitats to colonize along its journey. The dense root and leaf structure of knotweed stands make it nearly impossible for other plants to compete, and it is considered one of the world’s most destructive invasive species. The strong scent of the lacy white blooms attract bees. And, many humans are attracted to its shoots, foraging them for their wonderful rhubarb taste. Avoid sites actively managed with herbicides, and be sure to collect the shoots when they are young and tender – no more than 8 inches tall. 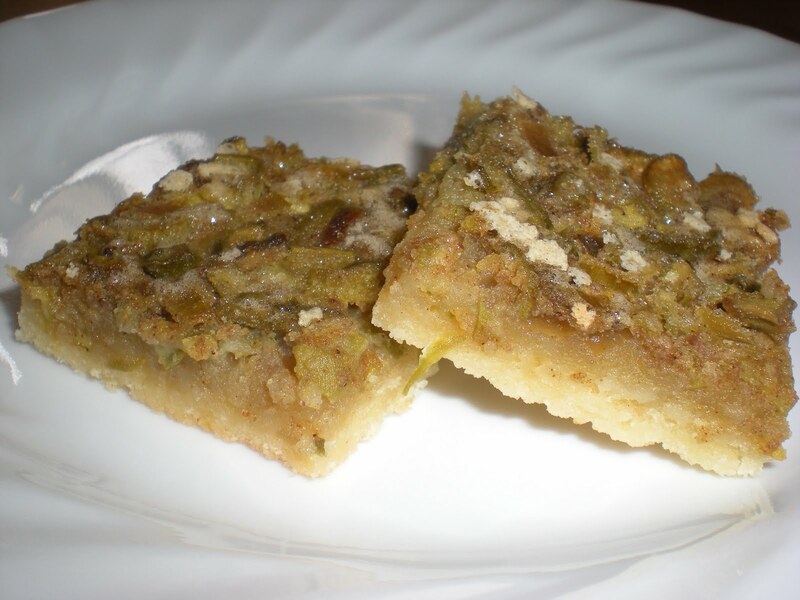 Writer and forager Karen Monger shares this note: These dessert bars should be made ideally with the thickest, but shortest stalks you can find so they will be fleshy without any woodiness. Heat the oven to 350°F. Grease the 11″ x 7″ baking pan. In a food processor, pulse the crust ingredients together to resemble coarse crumbs. Press the crumbs into the bottom of the pan evenly. Bake the crust for 12 minutes. For the filling, combine the eggs, sugar, flour, vanilla, and spices with a whisk. Stir in the chopped knotweed pieces and coat them evenly. Pour the filling mixture over the warm crust and spread it evenly. Bake 30-40 minutes, until the egg mixture is set and a toothpick inserted in the middle comes out clean. Cool. Cut into 1″ squares and serve. Place the chopped knotweed and water in a large pot and bring the water up to a boil. Reduce to a simmer and stew for 10 minutes, stirring often. The knotweed will change color to light green as it cooks and will start to fall apart. Add the sugar and cook 3 minutes longer. Remove from the heat. Puree the stewed knotweed and allow it to cool. 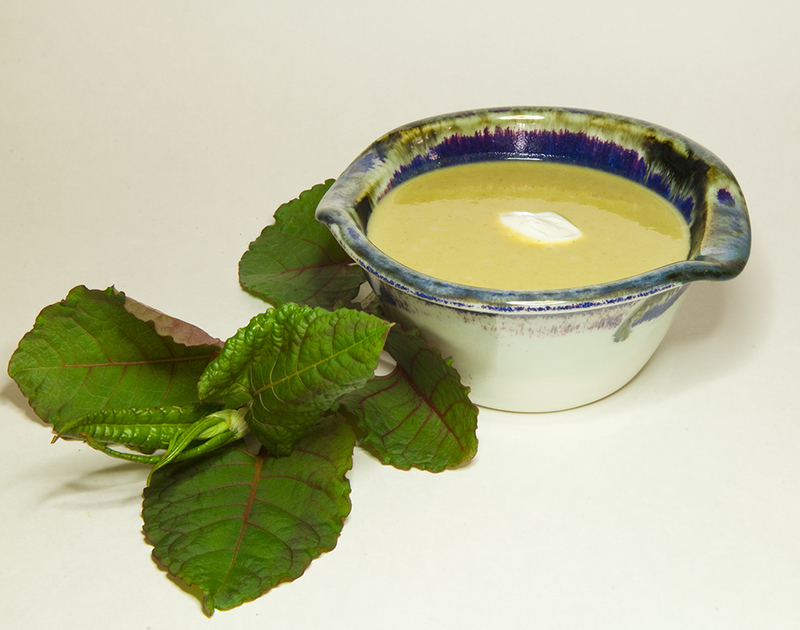 Spread the knotweed puree about 1/8″ thick in a dehydrator fruit leather tray or on a silicone baking sheet. 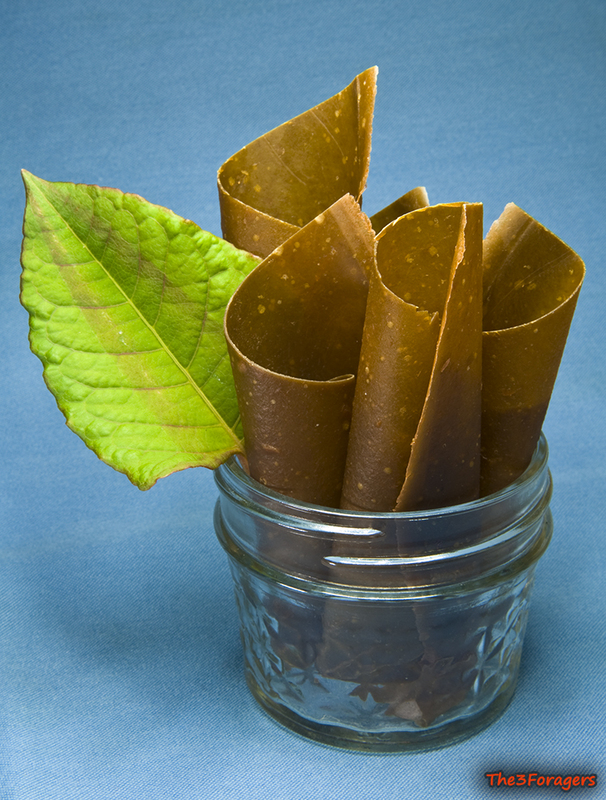 Dry at 150° F until the fruit leather changes to a darker green and is dry to the touch, or follow the manufacturer’s directions for a dehydrator. Makes 2 cups of puree. A special thank you to author and ecologist Corinne Duncan for her content contributions to the Japanese Knotweed Introduction. Soak the bean thread noodles in hot water for 10 minutes, until they soften. Rinse and drain well. In a bowl, add the chopped knotweed, chickweed greens, dandelion petals, ramps, and carrots to the bean thread noodles. Toss well. Soften the rice paper wrappers in warm water for about 15 seconds until they are pliable. Place on a smooth surface. Take about 1/2 cup of the noodle filling and place it in the center of the top third of the wrapper. Fold over the top of the wrapper to cover the filling, then fold in the two sided toward the center. Now roll the filled wrapper towards the bottom, enclosing the filling completely. This may take some practice! 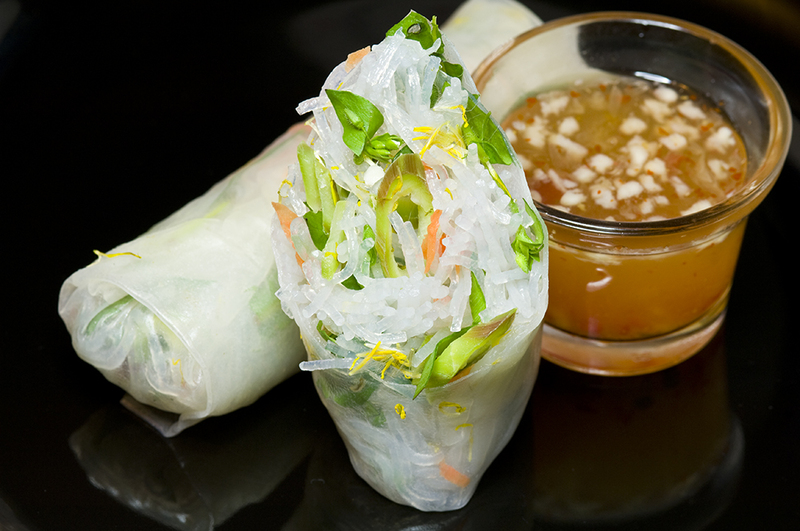 Chill the summer rolls for 15 minutes, and serve with a spicy-sweet Thai dipping sauce. Makes 6-8 rolls. This recipe is based on a Hungarian recipe for a chilled sour cherry soup. The soup is smooth, served cold as a dessert. The color is a lovely shade of spring green, and the soup would look wonderful garnished with some violets. A real taste surprise. Combine the Japanese knotweed, water and the cinnamon in a saucepan. Bring to a boil, and reduce to a simmer. Cook for 10 minutes, covered. Remove the knotweed from the heat. Whisk the sugar into the saucepan, mixing until the sugar is dissolved. Purée the knotweed mixture in a blender. Pass the purée through a fine sieve or through several layers of cheesecloth to create a smooth texture and remove any large pieces. Whisk the sour cream into the hot soup. Chill and serve. Preheat the oven to 325°, place baking papers in a muffin pan. In a saucepot, combine 1/2 cup sugar, the chopped knotweed stalks, 1/4 cup water and 1 Tbsp lemon juice. Cook over medium heat for 10 minutes, stirring often. Allow the stewed knotweed to cool. There should be about 1 c. stewed knotweed. In a large bowl, whisk the egg with the oil, and stir in the stewed knotweed. Sift together 1 c. flour, 1/2 c. sugar, baking powder, baking soda, and cinnamon. Stir into the wet ingredients in the large bowl, do not over mix. Fill the muffin papers about 3/4 full. Bake for 24-28 minutes, until the top is set and springs back when touched. Cool and serve with butter, or toasted. Makes 8 muffins. Mix the breadcrumbs with the corn oil. Layer a large, oiled casserole dish with soy-cottage cheese, Japanese knotweed, strawberry jam, oiled breadcrumbs, and walnuts, pressing everything down with the palm of your hand. Bake, uncovered, 30 minutes in a preheated 350°F oven. Chill. Serves six. 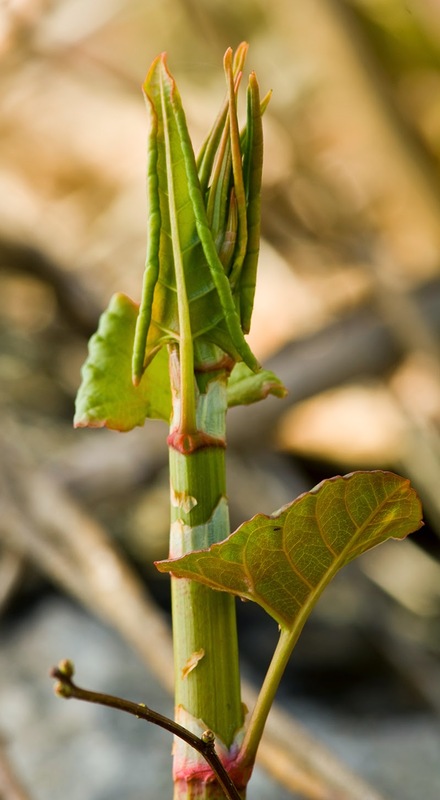 Note: Peel Japanese knotweed shoots that are over 1 foot tall as the skin tends to be stringy.